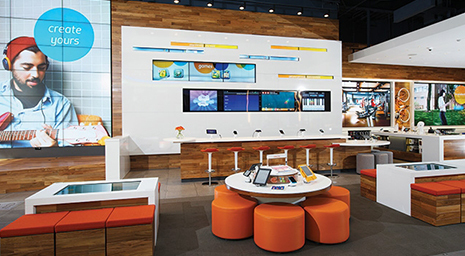 Last fall, AT&T opened a highly stylized retail store that looks more like a modern museum than a phone store. The sleek space is filled with state-of-the-art digital gadgets and gizmos, along with interactive games and an iPad-toting staff. Many credit Apple as the true pioneer of this revolution in retail where brick-and-mortar stores are wowing consumers with a high-tech, highly immersive shopping experience. Adweek.com offered an in-depth look at how retail is now selling the experience as much as the merchandise. “Other retailers are using the Apple prototype as they look to do retail in a more open marketplace,” said Gideon D’Arcangelo, lead strategist at ESI Design. Apple was the first to offer a fully digitized retail space and the tech giant’s in-store innovation ultimately inspired some of its biggest competitors today. AT&T’s Michigan Avenue store in Chicago has been generating buzz with its sleek design that may eventually be rolled out to its 2,300 locations, yet there are plenty of others, from Burberry to Nike, that are majorly upgrading their stores to digitally dazzle consumers. Rumor has it that Apple may be raising the bar even higher with another complete renovation. Yet the secret to successfully enhancing the in-store shopping experience is making sure that the interpersonal element is as impressive as the interactive one. Today, that means going beyond mere customer service to creating meaningful interactions with consumers that make them feel pampered and appreciated. Now, all kinds of industries are giving themselves high-tech makeovers. Auto service chain Pep Boys is introducing a brand-new retail experience in Tampa, where customers can get free WiFi and charge their digital devices. These features were added to show customers how the company is evolving to meet their modern-day needs. Some experts claim that these physical stores are upping their games because they feel threatened by the rise of online shopping and success of major e-tailers. It may surprise them to learn that leading e-tailer Amazon is considering expanding into a physical location. The e-tailer has already set up a few pop-up shops in New York and there’s buzz that a brick-and-mortar Amazon store may be on the horizon. There’s still more innovation on the way, such as a new program for a major Russian retailer that features facial-recognition software able to determine a customer’s gender, age, and general mood. Other advances coming to stores include heat-map and dwell-time analytics. While stores are striving to digitally thrill consumers, some are wondering if that wow factor pays off. It’s still too soon to tell, but retailers believe that upgrading the in-store experience will ultimately up their sales. Take your retail marketing in a digital direction. Contact MDG Advertising today 561-338-7797, or visit mdgadvertising.com. MDG Advertising is a full-service advertising agency and one of Florida’s top creative ad agencies. With offices in Boca Raton and New York City, MDG’s core capabilities include branding, logo design, print advertising, retail marketing, digital marketing, mobile marketing, email marketing, media planning and buying, TV and radio, outdoor, newspaper, video marketing, Web design and development, content marketing, mobile marketing, social media marketing, and SEO. To stay on top of retail’s latest trends in marketing and advertising, contact MDG Advertising today at 561-338-7797. Click on “Brands Test Ad Targeting Technology at the Store Shelf” to learn more about the latest digital innovations in retail marketing.